LTHForum.com - Rachael Ray wants to know your favorite Chicago pizza place. Rachael Ray wants to know your favorite Chicago pizza place. LTH Home > Chat > Other Culinary Chat > Rachael Ray wants to know your favorite Chicago pizza place. Not only so she can go squawk arbitrarily at the proprietors and get some unorthodox shots of herself stuffing her maw with their wares, but so she can pit it against New York's best in some sort of daytime television battle royale. Hey Chicago! Rachael is heating up the competition between the Windy City and the Big Apple with a pizza throwdown, and she wants you to decide who's got the hottest pie! Cast a vote for your favorite pizza, or write in your own. Then, stay tuned to find out who'll get the ultimate bragging rights as the cities go head to head! Those vendors already on the ballot give a good representation of what one might imagine Rachael Ray's favorite "Chicago Style" pizza places are (Connie's, Home Run Inn). Fortunately, the ballot allows for write-ins. In case you forgot, the address for Pequod's Pizza is 2207 N. Clybourn Avenue. Do your duty, if not to hoist Pequod's unto victory then at least to show the daytime-television-watching American people that Chicago has more to offer than the default options! Before I write in my answer, I'll ask first... do we want Burt's or the Pequod's Morton Grove location to be completely exposed? RR can kiss my a$$ who cares one way or the other.... I love NY pizza & I love Chicago pizza. 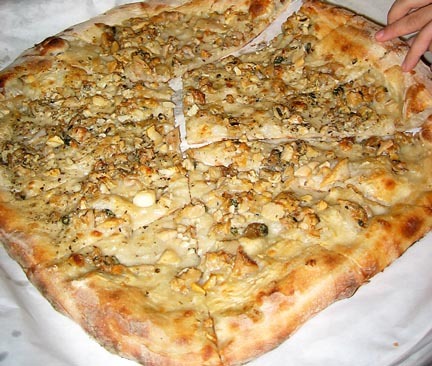 For my $$ I'll take Pepe's New Haven white clam and garlic pizza over any pizza I've ever had elsewhere. Great. LTHForum's two favorite topics rolled into one: Rachel Ray and NY vs. Chicago. Should I just lock this thread now or wait a few days? As long as Rachel Ray doesn't fly up into eatchicago's face, I suspect we'll be okay. Favorite piece of precious bullsh*t: "I have researched this for over a year and think there is a demand. I have already sold one." He served one today (actually, there were two being shown) on the Today Show. Al Roker wrote: That sure is a lot of cavier. Connie's on Archer is my vote. gmonkey wrote: Before I write in my answer, I'll ask first... do we want Burt's or the Pequod's Morton Grove location to be completely exposed? After the insane drunken monkey weekend we just had (Sharon was watching the grandkids who were in from out of town and I worked the whole weekend for her) please, please, please DO NOT mention Burt's to Rachel Ray or any other widely exposed media food folks. We're doing just fine keeping up with the "LTH effect" and can't handle much more. Looks like Home Run Inn got the nod. Okay..had to share this. Watch that video without sound. Her amateurish performance abilities REALLY look scary when you're watching her without sound. It's also a nice change of pace from her very gravelly, almost ruined voice. Someone needs to warn her about what happened to Lucille Ball when she did a broadway show for a year--compare Lucy from I Love Lucy and Lucy in The Lucy Show -- and it's evident. She needs vocal therapy!!! I was pulling for Vito & Nick's, but I'm happy to see another Southwest Side institution get the nod. But, yeah, not the expected choice. "I can't believe I have to shill for this crap. Up next, Britney Spears is out of rehab! Details after the break, followed by the five-day Doppler forecast!" Well, she's back in town and was spotted at the GCM this morning, apparently made quite the stir. Apparently she is in town to promote her talk show moving to WGN. Anyone spot her there? I heard she was rather unpleasant today. I didn't see her, but the double-wide strollers were out in full force. Rightly or wrongly, I blame her. Ursiform wrote: Well, she's back in town and was spotted at the GCM this morning, apparently made quite the stir. Apparently she is in town to promote her talk show moving to WGN. Anyone spot her there? I heard she was rather unpleasant today. I was wondering why there was a huge television crew there today (about 9 am or so) . . . I saw them walking around and filming but I didn't see her (thankfully because I might have slugged anyone uttering the phrase "yummmmmmo"). jesteinf wrote: I didn't see her, but the double-wide strollers were out in full force. Rightly or wrongly, I blame her. We were there with a double-wide stroller trying to avoid her at all costs. Didn't see La Rachael -- however, I did catch a glimpse of the ever so cool Stephanie Izard sipping some Intelligentsia and looking at veggies. I restrained myself and let her be. I was really p.o'ed at the camera crews. They were very annoying. Way less annoying than double decker, triplewide baby carriages full of screaming future serial killers. Yet another reason to avoid Green City and stick with Evanston on Saturday mornings. . . that, and the lovely green zebra tomatoes from the MSU guy at the far SW stand (by the Metra tracks) were going for a ridiculous $1 a pound by 12:30 today. Cheap-to-free parking, dozens of top-quality vendors, and GUARANTEED 0% RR CONTENT! Didn't see her. I was out of there and back home before 8:45 a.m.
That said, I suspect her visit will re-invigorate the market with lurkers who don't buy jack! I've spoken to a few farmers this year and they say it's jam-packed w/folks but nobody's cleaned out of their wares at day's end. In fact, they get in the way of talking to customer's who are actually going to buy food (particularly food that requires them preparing it when they get back to their own kitchen). pairs4life wrote: I've spoken to a few farmers this year and they say it's jam-packed w/folks but nobody's cleaned out of their wares at day's end. In fact, they get in the way of talking to customer's who are actually going to buy food (particularly food that requires them preparing it when they get back to their own kitchen). There is some truth to this, at least based on my observations. On three different occasions I had to push my way through groups of people standing/gawking/tasting to actually buy something. At the Saxon Creamery booth I waved my money from three people deep and they ushered me through the crowd of tasters. Thanks for the link to that GCM Tweetering page. It explains why no one at the Green City Market has found time to reply to the email I sent a week and a half ago. Well, I take that back. 6 days after my detailed email offering constructive suggestions and asking a couple of questions, I finally got a reply from someone who just said "We got your email and I have forwarded it to the market manager". Never mind that my original email had gone to the address provided on their website for the market manager (with a cc to the executive director, who has posted here on LTHForum). Since that cryptic, helpless response, I've heard nothing further. At least I understand why now. They were too busy twitting, making plans for The Big Yummo's visit, and waiting for all of the underripe peaches at their market to become edible.